I want to raise my kids with an appreciation for food - good food, fresh food, food prepared from scratch. I know, especially during the age of convenience, that this will take a lot of time, patience, and effort. But making the investment is important to me, and early at that. So earlier this week, I took to the kitchen with little Ella and attempted to make two dozen chocolate chip cookies. Needless to say it was a mess. By the time we were done, there was sugar everywhere, she was in nothing but a diaper, and my top half was covered in the brown sugar, egg mixture. But all of that didn't matter, because she loved it. She's a little young to really be of assistance or to understand what exactly is going on, but the beauty in that was she didn't need to be of great assistance, and she understood just enough to have fun and learn a little. 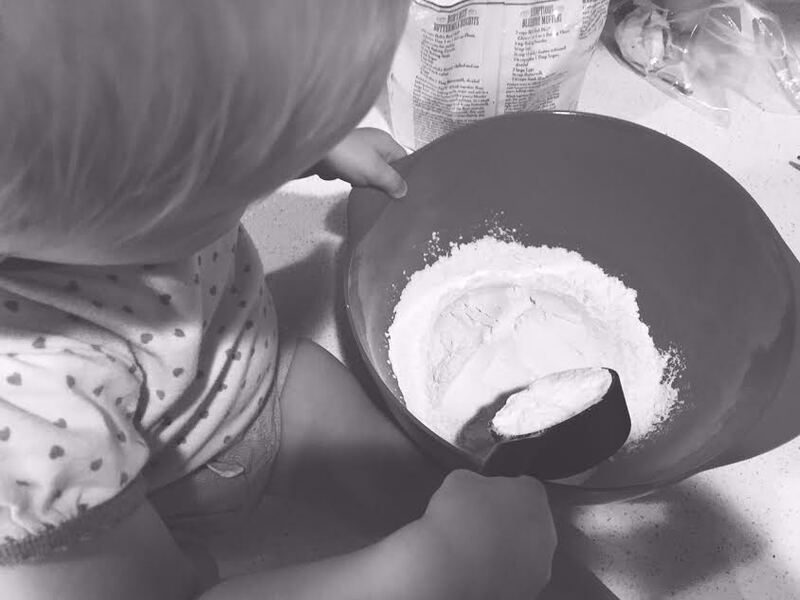 She loved stirring the various mixtures, and feeling all kinds of different textures. 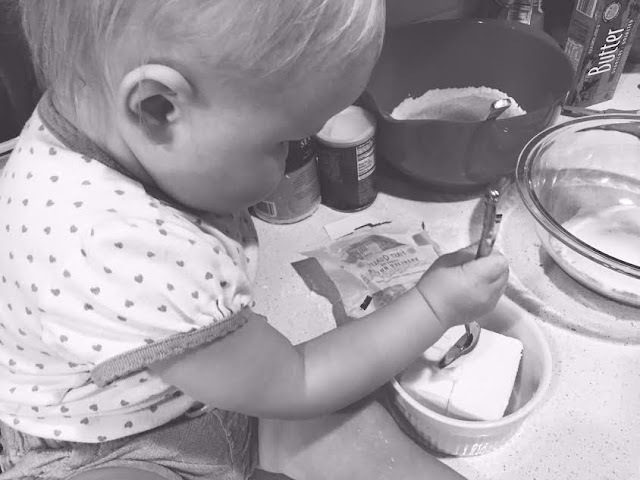 By the time we were ready to put them in the oven, I questioned whether or not they would turn out due to the grand amounts of flour and sugar that, with Ella's help, escaped the bowl. But all turned out well. 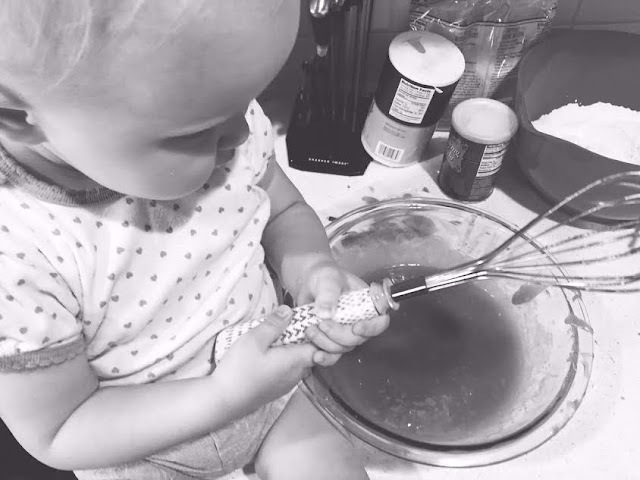 She loved watching the cookies bake in the oven and getting to taste the fruits of our labor. I had zero expectations when I whipped out the recipe. I was ready for her to maybe lose interest or for the bowl of batter to fall to the floor, but our baking venture turned into 24 delicious warm chocolate chip cookies, huge smiles, and dessert for days -- a win all around. I'm sure life will get busier, especially when our little guy arrives, and I'm sure we'll resort to frozen chicken nuggets on more occasions than we'll like to admit. But it's these moments that I'll always try incorporate into my kids' lives. Because let's be honest, it's really warm chocolate chip cookies and these memories that make a house a home.